WILMINGTON, Delaware, USA -- Key Safety Systems has agreed to terms on the $1.6 billion purchase of assets of Takata, stricken by a recall of its faulty vehicle airbags, and final documents will be signed in less than two weeks, a lawyer for Takata's U.S. unit said on Monday. Takata and its U.S. unit, TK Holdings, filed for bankruptcy in June and the asset sale to Key Safety Systems, or KSS, is the cornerstone of its plan to raise funds to compensate automakers and drivers. Marcia Goldstein, a lawyer for TK Holdings, told a U.S. bankruptcy judge on Monday that a U.S. deal had been reached and was being reviewed by lawyers in Japan, Germany and elsewhere. "The documentation is fully negotiated, subject only to what all the lawyers agree is clean up," said Goldstein, an attorney with the Weil, Gotshal & Manges law firm. The sale must be approved by the U.S. Bankruptcy Court in Delaware, as well as regulators. TK Holdings said when it filed for bankruptcy that final papers on sale to Key Safety, a Michigan-based parts supplier owned by China's Ningbo Joyson Electronic, would be provided within "a few weeks." Takata in February pleaded guilty in a U.S. federal court to a felony charge as part of a $1 billion settlement that included compensation funds for automakers and victims of its faulty airbag inflators. 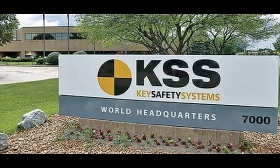 Under the settlement, the sale to Key Safety Systems must close by Feb. 27. Takata faces tens of billions of dollars in costs and liabilities resulting from almost a decade of recalls and lawsuits. Its airbag inflators have been linked to at least 16 deaths and 180 injuries around the world because they can rupture and send metal fragments flying. Key Safety plans to take over Takata's viable operations, while the remaining operations will be reorganized to continue churning out millions of replacement inflators, the two firms said.